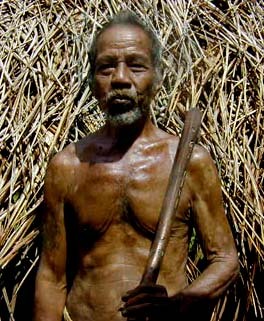 "I was born in here in Wanyaan village and a man from Gachpar came and adopted me. I am 85 years old. Pebnaw in Gachpar belongs to a lady named Huchol, who is my adopted father’s sister. I’m only an old man in Gachpar. “During the war, I went to Japanese school for five years, then after that I worked for the Japanese as a teacher, teaching or translating the Japanese into Yapese or to the Outer Island language." 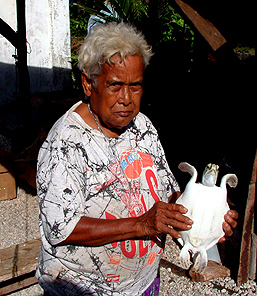 "I’m from Gachpar, Gagil municipality, Yap Island. I already retired from Land Resources and I have a part time job at HPO, Historical Preservation Office. I’ve been working there about two years. "I am a member of the Pebnaw council in Gachpar. Gachpar has a relationship to the Outer Islands. To Mogmog in Ulithi Atoll. Long time they used to come by canoe. A fleet of canoes used to come all from Chuuk all the way down to Ulithi,and from there, taking their offerings to Gachpar. These men from Pebnaw used to take the offering to all the Men’s Houses in Gachpar. That Men’s House is called Falsew. “Antonio Taithau is presently chief of Mogmog," says Stanley Marer, Antonio's 'lieutenant.' 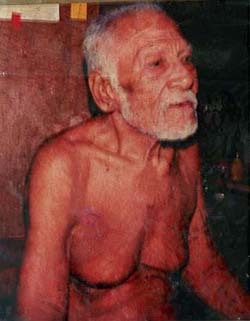 "He is number one of the five mtaang. He is our 'chief of police.' Before, the mtaang spoke for the king, because we had a king. Now, we don’t have a king, so we just remain as mtaang. 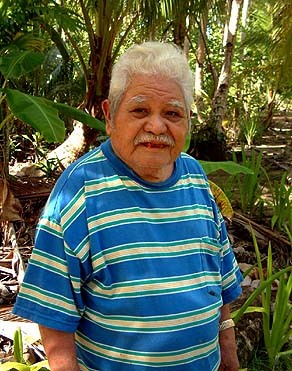 “Antonio was working with the Japanese during the Japanese administration in Yap. He was one of the laborers. They did the gardening for the Japanense military, and they did the fishing, and various kinds of very low jobs. Local people were kind of suffering. The military used to make sure that no local people would take anything from the military gardens. And the military controlled all the fishing grounds. Antonio helped in all these, and he tried to spare other people some food. So he’d get one or two guys to get food, and away they’d go to give to their relatives, the local people that are there with them. They did this secretly—they didn’t want the military personnel to find out. "Now Antonio is not well to travel, so he has appointed Hilary Tacheliol to represent him in the Council of Tamol, on Yap." "I’m the chief of the island of Falalop only. Not the whole atoll. For this island only. During the war I was in Yap as a student. In 1941, I joined the Japanese school. I speak Japanese and Yapese. 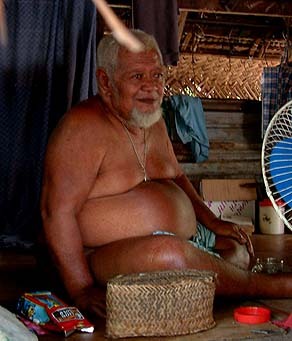 "This community has ten clans, and two clans for chiefs. The clan that I am standing on, my clan, is chief of the island. The other chief is for the people. And the other eight are controlling reefs and fishing; agriculture, taro patch and all those things; and the other two are policing the island, watching over the island. They take orders from us, the higher chiefs—of the people and the land. Sometimes we get together, discuss what can be done on the island." “I'm working with YapSEED in the area of curriculum. I'm the Ulithian local linguist, and I author children's books that are being used in the Ulithi area, including Fais, Sorol and Ngulu. "I was born on Asor, although I consider myself from Asor and Falalop, because my mother is from here and my father is from Asor. And I spend most of my time here on Falalop because of the work that I do. I make rounds throughout the Ulithi lagoon, checking and monitoring the school curriculum. "Sometimes if the radio cannot communicate to the school, I just go to that school, and the kids are caught unexpected and they feel they are not ready for a test. And it could be that I did not go to give a test, but went there on a family trip. But as soon as they see me on that island, they think there is going to be a test!" 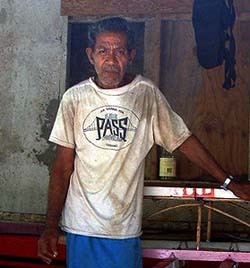 "I was born on Falalop and have lived here all my life, except for when we were all moved to Fedraey by the U.S. military. I am a woman leader on Falalop because I am older, but also because I come from a platform that leads and does decision-making. It's not my own decision-making, but it comes from that particular platform, Faaelhawael. Even if there are some people older than I, I can still make the decisions. "Faaelhawael is the decision-making platform for men and women. It is just below the highest platform. The highest chief comes to the man on Faaelhawael and tells him, 'Say this to the people...' and he is the one to blow the conch shell, gather the men at Fal'mwaay Men's House. Then no one is supposed to talk, they just listen, while he speaks for the chief. "I do the same thing, calling the women together." "I am from Mogmog, but I think I live more on Falalop than Mogmog because I was only 18 years old when I left the school in Yap, and then when I came back, I went to school in Guam and in Pohnpei. After that I started working here for 33 years, teaching. "I will talk a little about the authority system of these islands. All these islands have chiefs and what we call mtaang which I think are the most active people in the authority system, as they carry out the decisions of the chiefs. I am more familiar with the mtaang in Mogmog because I am from there. And so I will talk mostly about the mtaang, the chiefs and authority system on Mogmog." 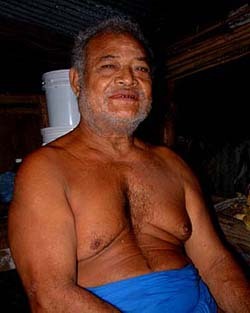 "I’m from Ulithi, actually 50-50, half Mogmog and half Asor, and I usually live on Asor island. 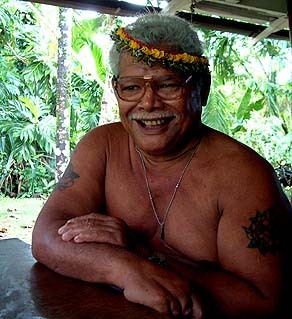 I’m part of the group what they call Council of the Outer Islands of Yap. Since there was no one in my family in Asor who was strong enough to attend the Council’s meeting, I was representing the island of Asor now, instead of Mogmog, in the Council . I represent them here on Yap and also in Ulithi. I consider myself as chief of the island of Asor, Asor island. "I grew up here on Yap. I came down from Ulithi barely talking, and that’s one of the reasons that I can speak Yapese almost as well as Ulithian, because my first language was Yapese. I usually met around with Yapese kids, and that’s how I picked up Yapese. 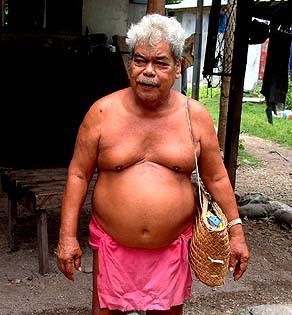 And so, just before the Americans attacked Ulithi and Yap, I think one year before that, I went back to Ulithi." "I’m the Deputy Director of the Department of Education, assisting the director in the operation of the Department. I’ve been doing this for quite some time, going on about nine years, and I have been in education for about twenty-seven years. "I’m from Fedraey island in Ulithi—well, actually from Mogmog and Fedraey. My father’s from Mogmog, my mother’s from Fedraey but I was raised on Fedraey by my grandparents." "I was adopted into the estate of Legfaeliuy, one of the five mtaang of Mogmog. The responsibilities of these five mtaang are like police. And carry out orders as the right hand of the chief or the king. We’re a monarchy, so the king assigns us to be responsible for certain things. To enforce the laws and the rules, regulations. We also cut the fish in the taboo platform and we make sure that everybody has a share. So we have to responsible and to make sure that all these are handled properly. "My adopted family told me, ‘you stay when we die, and you stay, don’t worry about it, just do the function. Make sure you function well, you do exactly what we told you, because if you don’t, you see, you fail your part’." 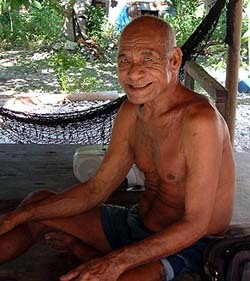 Mariano introduces: "Roke Wur is from Asor Island, a leader and the oldest man on Asor now. We cannot say exactly how old he is. We suspect he is probably over 100 years old. "He designed and supervised this Men’s House on Asor that is still standing today. And when, in the past, when the real Chief of Asor was not present, or was not feeling well, it was he who sat in place for the chief on meetings regarding Asor Island as well as Ulithi islands affairs. 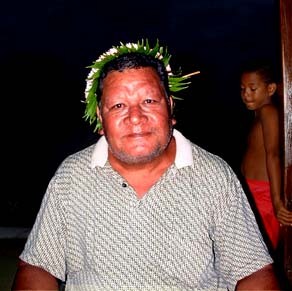 "He has been on the tribute trips to Yap, and I think he served or represented the clan on the tribute trips more than most people here on the island. Before each tribute trip they would gather all the clan and they say ‘who is going to represent us?’ He usually was the one who went into Yap for the tributes." 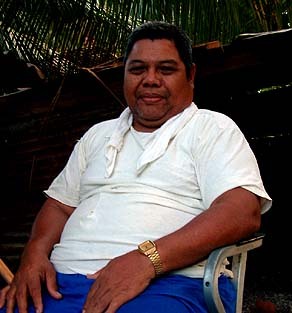 "I’m not from Ulithi, but from the Island if Ifalik. Now I’m here in Falalop Ulithi. I’m working for Ulithi Adventure Resort, working for maintenance. Maybe I've spent two years here. 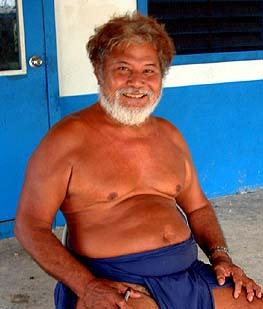 "Back on Ifalik, I was making canoes and sometimes I was sailing from Ifalik to Woleai. And making houses, cutting tuba, going out fishing." We have asked Steve, a skilled navigator, to contibute on the traditions regarding sailing and weather, knowledge now mostly lost on Ulithi but still preserved on his neighboring home island. 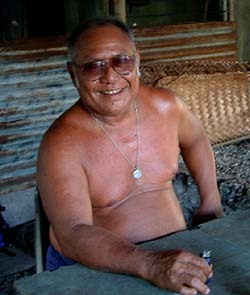 "I’m working for health services, in charge for the dispensaries here in Ulithi Atoll. I was a teacher after finishing high school, then I spent three years in nursing school on Saipan. Then I worked on Yap for a few years, after which I did a one-year Medics program on Chuuk, followed by six months of internship. I spent three months in Hawai‘i for additional training, also three months in the Naval hospital in Guam, working in the lab. "I’m sixty-two years old now and planning to retire. But I still haven’t found somebody else to take my place. I send my own son to go to medical school so he could replace me. Now he ended up in Yap. I sent another girl to go and train in Yap, and now she’s working in Yap married to somebody and she cannot move out here. So the only thing for me to do is to run away! No more kids because, at age sixty-two, that age cannot do!" "I used to be school teacher, now I’m a CRT—Consulting Resource Teacher—here at Mogmog Elementary School. We’re helping usually the slow learner kids and problem students, that’s what we do. Not really that much problem here at the school. We don’t have very severe cases here so we lucky at this time; maybe later on. I am also a catechist at the church. "During Japanese times, my father was an interpreter. He was good in Japanese. 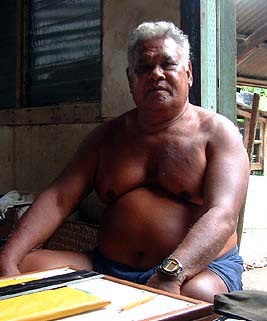 He went to Palau, before high court, to defend somebody, he and one of the chiefs. They went there and they won the case. That’s what I heard." "I’m from Mogmog. I grew up here and I was attending High School in 1965. And then we started from 7th grade in high school. So, I was attending 7th grade in high school and I moved to Honolulu. Our principal sent me there for training. I went there, and then our priest sent me to Saipan to attend Mt. Carmel School, so, when I finished high school, Mt. Carmel, 1972. I stayed there until October 1972 and I came here. 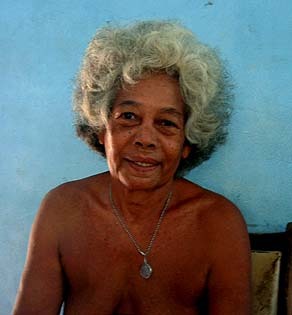 "In 1973 I got married to Ignathius Regue and I moved to Yap with my husband, he was working there. He’s the dental officer. We used to travel to Yap and back, Yap and come back. Ship or plane. Since 1996, and my husband stopped working, and we came here, we’re stationed here." "I’m from here, Asor island. I’ve been to all the islands. I used to work for the Government Department of Education. I was the one who hired Mariano to work. He worked for me at one time. I worked in the administration, neighboring island school administration. Then I got sick and I stopped. "Right now I’m the catechist here, working for the Catholic church here, also the leader on this island. Things are pretty quiet here on Asor. Very quiet here. I like it here." 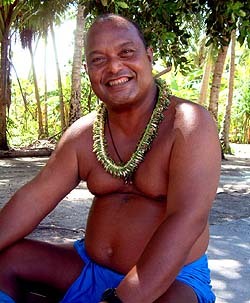 "I’m from Falalop, Ulithi. I grew up here on this island, and I was here during War. I was twelve years old when the Japanese came. I worked for them on Fais island, as a telephone exchange operator. At that time, there was no airport here in Ulithi. This one here was built by United States during the War. "At that time, the Japanese government had a policy that every young boy should go to school in Yap for five years to learn Japanese. Five years and come back to Ulithi. I never left. And after that, Barney is one of them, they moved him to Yap, for like working like a slave." "I think I'm the second oldest person on Mogmog. Also, I'm on one of the highest ranking platforms on the island, so I am considered as a chief of the island. My clan is one of two clans responsible for the cutting up and distribution of fish on the Rool'oang platform. "Since I’m older, I know some of the old kind of navigation and some of the mapping and the ways to go around this atoll. There are places where you cannot go—it’s a kind of a taboo, that you cannot take your canoe there. Such a place is not supposed to be entered." 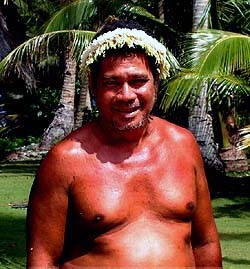 "I'm from from Fedraey in Ulithi. I’m a former culture teacher at the school here. Also a carver, especially in carving paddling canoes and sailing canoes. Not really many people know how to carve a canoe. I’m the only one that I know of in Ulithi that still carves canoes. "But it seems like even the children at school here, they’re not interested anymore in carving. I always ask them to come and try to learn how to carve. I started teaching canoe building when I was still a teacher at the school. But when I stopped teaching, nobody’s teaching any more about building canoes." I was born on Mogmog, but was adopted and reared by a couple in Falalop, Ulithi. I attended junior high in Yap, and then returned to Ulithi where we started the Outer Island High School. In the morning we would take classes, and in the afternoon we would work on the high school's physical structure. During my junior year, at the age of twenty, I was taken to the United States and adopted by an American medical doctor, D. Carleton Gajdusek. There, I continued my education, earning a Masters Degree in Anthropology from the California State University in Fullerton. I have also taken many other graduate courses at the University of Hawai‘i and the University of Guam. At present I live on Guam with my wife and two children. "I was born in Falalop. I’m retired now. I did a lot of different kinds of things. I used to work for the Coast Guard, and I was sailor. 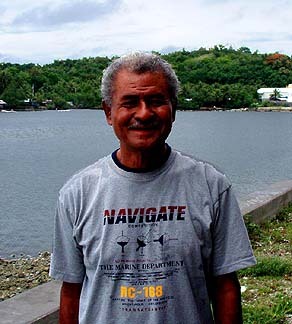 Plus, I worked with the Navy for a while in Yap, myself and Manuel. We worked for the Navy for twenty dollars a week—no, every two weeks. "And after that I worked with Coast Guard, from 1952 to 1963. When I was working with the Coast Guard I used to go to Guam every six months to get my physical. I have eleven children, plu grandchildren and great-grandchildren." "I am a retired dentist. I studied dentistry in Fiji, where I stayed for about 6 years. 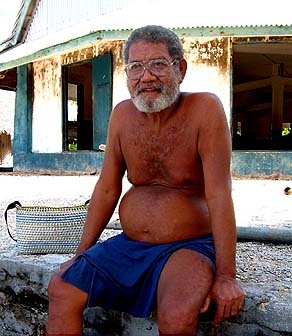 During the War, I was in Yap, but I was very small. We went there, my parents were there, because my brothers were attending Japanese school. We came back after the War. 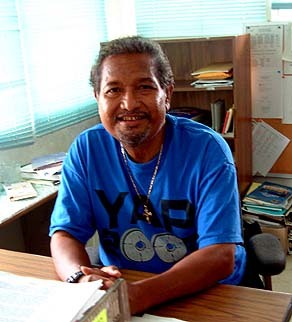 "I went to Xavier High School in Chuuk. It was difficult, I just managed to pass. I came here and then from, I work a little bit in Yap and I went to school. 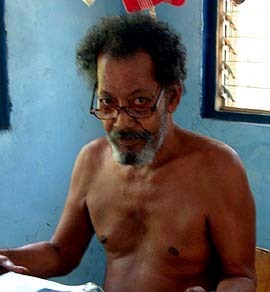 Then I practiced dentistry here in Ulithi. I was not very busy because many people are afraid to come!" "I’m from Fedraey. I’m working here at the Fedraey Elementary School. I taught level 1 and 2 for this fourth quarter, maybe the next school year we’re going to rotate, change, somebody going to take my place. Somebody going to teach first and second grade, maybe I’m going to teach 3rd and 4th, we still don’t know until next school year, and then we meet with our principal, school board and we going to decide who is going to teach a certain grade level." 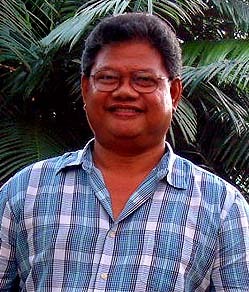 Pedrus Ramaliol, Principal of Asor Community Elementary School. 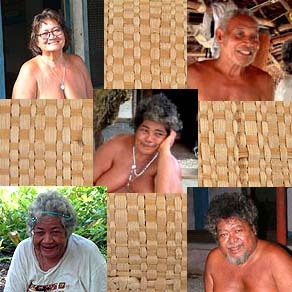 Let these wonderful people take you on a journey through Ulithi and its culture. Turn the page to see the location of this village.